Reading room of the Oriental Collection, The Library of the Hungarian Academy of Sciences. The Library of the Hungarian Academy of Sciences in Budapest hosted a workshop on 12th and 13th June 2008 for the partner institutions involved in IDP-CREA. Staff from all the participating European institutions attended the workshop to discuss the schedule and work programmes of IDP-CREA over the next year. Workshop topics included detailed plans for the launch of the French IDP website, targets for training and collaboration between different national institutions, discussion concerning material for photography and digitisation, procedure for dissemination of publicity material throughout Europe, plans for educational activities, debate about the choices of artefact for object biographies (tracing the journeys of objects from Asia to Europe), and research, liaison and events with the three Chinese associate partner institutions. Thanks to Kinga and Agnes from the LHAS for their organisation which ensured a thoroughly enjoyable visit for all to their beautiful city. On 25th June 2008, four members from IDP-UK went to Paris for a visit hosted by the Musée Guimet to discuss IDP-CREA collaboration. Technical, legal and curatorial staff from the Musée Guimet and the Bibliothèque nationale de France convened to discuss the legal framework for the collaboration, the timetable, what to include and the technical issues. The object biographies were also discussed. It was agreed, because of the forthcoming summer break in Paris and the amount of data to be incorporated into IDP, to schedule the launch of the test French IDP website to the end of 2008, with a full launch in spring 2009. Thanks to Jérôme Ghesquière and his colleagues for their organisation, and to all participants for their time, input and enthusiasm. On 10-11th July, 2008, three members of IDP UK went to Berlin for a visit to the German IDP-CREA participants, visiting both the Turfanforschung and the Museum for Asian Art. As with the Paris visit, technical, legal and curatorial staff from both institutions convened to discuss the legal framework for their collaboration, the timetable, what to include and the technical issues, as well as object biographies. Simone Raschmann of Turfanforschung showed work on her object biography, which will act as the template for others. 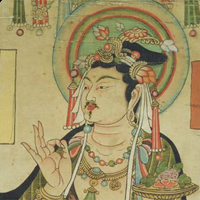 It concerns a Turkic copy of the Sutra of Golden Light and its transmission. Thanks to everyone in Germany for their organisation and hospitality. Historical photographs of China taken by Europeans in China and drawn from collections in the United Kingdom went on display, many for the first time, in a major exhibition held at the National Library of China (NLC) from 25th September, 2008, in conjunction with the British Library. The British Library holds a unique and valuable collection of historical photographs taken by Europeans in China, documenting the western response to the landscapes, peoples and events in the Chinese Empire during a eventful historical period. Starting with the Second Opium War of 1860 and culminating with photographs of Beijing in the mid-1920s, these images are of major importance both in the international history of photography and as a documentary record of events over half a century of change and upheaval. Many of the photographs, which were displayed as digital facsimiles, were previously unexhibited and are the only surviving record from a period when photography was rare and material scant. 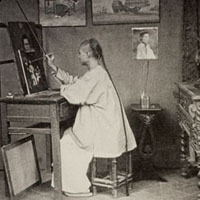 These include the work of Felice Beato, who recorded the Anglo-French invasion of 1860, John Thomson who travelled widely in the Chinese Empire in the early 1870s, and the magnificent portrait and costume studies of Milton Miller from the early 1860s. They portray a bygone era, a compelling and evocative picture of a vanishing world, illustrating the land and people of China, as well as the former topography and architecture of such great cities as Beijing. In addition to photographs from the British Library's own collections, the exhibition featured a selection of rare material from other major British archives and private collections, including the Royal Asiatic Society. 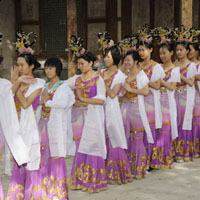 School children perform traditional Dunhuang dancing as part of the Education day. During October 2008, three IDP staff travelled to the Dunhuang Academy (DHA) as part of a collaborative three year educational project funded by the Ford Foundation. The trip centred around a one-day workshop about the Dunhuang cave complex for local school children. The team were also fortunate to accompany members of the DHA on a field trip to the archaeological site of Kharakhoto (Heishuicheng in Chinese) in present-day Inner Mongolia in preparation for a larger IDP tour of southern silk road sites in November. Over several months in advance of the October visit, colleagues at the DHA established links with a local secondary school. On Tuesday 7th October, a class of around thirty 15 to 16 year old students from the school attended the event which comprised a morning session of presentations from both DHA and IDP staff, and an afternoon tour of the cave complex followed by performances inspired by the caves from the students themselves. 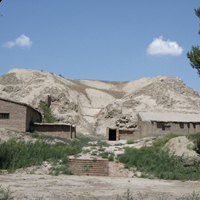 Professor Luo Huaqing, Director of the DHA Exhibition Centre spoke on the history and context of the Dunhuang caves. Alastair Morrison and Abby Baker of IDP introduced the IDP website and spoke about the importance of digitisation in accessing Silk Road collections worldwide. Mr Liu Gang, Head of Digitisation at the DHA gave a general introduction to various techniques and motivations for digitisation and showed students some examples of digitisation work focusing on various wall paintings from caves at the Mogao complex. Student performances included demonstrations of traditional Dunhuang dancing, singing and martial arts as well as accomplished sketches in English and Chinese based on the local area and its culture, past and present. Following the workshop, IDP staff travelled with colleagues from the DHA to Kharakhoto in Inner Mongolia. Using images stored digitally on a hand held hard-drive and copies of Stein's archaeological site plans we were able to survey the ruined walled city by comparing it with photographs taken by Stein about a hundred years ago. Using the historical photographs as a guide, we collected a range of new data, re-photographing the historical images for comparative purposes where possible as well as collecting GPS readings of the main structures, notes concerning changes to the site, video footage of the site and a range of supplementary photographic images to document the site in further detail. Left: Stein Photo 392/29(85) of a Gumbaz at the south western corner of Kharakhoto, 3rd June 1914 © British Library. International Dunhuang Project and Xinjiang Institute of Archaeology members at Rawak during their field trip to the southern Silk Road, November 2008. 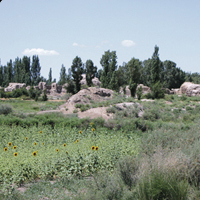 An IDP team has just returned from a two week field trip with the Xinjiang Institute of Archaeology to archaeological sites on the southern Silk Road. This was part of the EU-funded IDP-CREA programme, with additional support from the Sino-British Fellowship Trust (SBFT). Two photographic teams concentrated on taking documentary photography of sites visited and photographed by Aurel Stein a century ago, including Miran, Endere, Rawak and Mazar-Tagh. The photographs and data will be added to the IDP database and to a Google Earth interface and reference sets given to the Xinjiang Institute of Archaeology. Two scholars, one from the Institute and one from the Xinjiang Cultural Relics Bureau, will visit IDP in the UK in 2009 to help with this work. Funding for their visit is provided by the SBFT. IDP would like to thank the sponsors and both the Xinjiang Institute of Archaeology and the Xinjiang Cultural Relics Bureau whose support made the trip so successful. A full report will be given in the next issue of IDP News (Winter 2008/9). The ruins of the ancient city of Beiting. The three members of the Turfan Study Group (Turfanforschung) Yukiyo Kasai, Abdurishid Yakup and Desmond Durkin-Meisterernst travelled on 17 October 2008 to Turfan to take part in the 'Third International Conference on Turpan Studies: The Origins and Migrations of Eurasian Nomadic Peoples' from the 19-22 October, 2008. Peter Zieme (Director of the Turfanforschung up to April 2007), and Christiane Reck and Simone Raschmann of the Union Catalogue (KOHD), also attended the conference, so that both Berlin research groups working on the Turfan Collection were for the first time all together in Turfan. 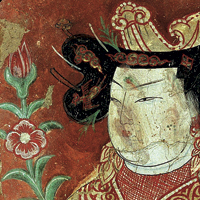 Under the leadership of Li Xiao (Director of the Turfan Museum), the Turfan Academy and Turfan Museum organised the conference, which had more than 150 participants from various fields, including. prehistory, archaeology, art history and philology. It was an opportunity for exchange with colleagues from China and the whole world., even though it was impossible to attend all the lectures in the parallel sessions. The mound of the western Buddhist temple outside the city walls. We presented some 20 copies of our booklet 'Turfan Studies' about our work in Berlin and gave a short interview for a local television channel. On 20 October Li Xiao, Professor Umemura and Durkin-Meisterernst signed an agreement with the Museum to catalogue and edit the non-Chinese texts found since 1980 and kept in the Museum. Professor I. Yusup of the Museum in Urumqi and Ablim Keyyum of the 'Bureau of Turpan Cultural Relics' were also present at the signing. This agreement gives the Berlin group an important role in the work on newly found material and allows us, together with the Japanese group, to help in training future Chinese specialists. After the conference we took part in a six-day journey to various sites in north-eastern Xinjiang, the most interesting part of which was the visit to the Buddhist site west of the ancient capital site of Beiting (Bišbaliq), the northern counterpart to Gaochang. Since then city has been hardly explored at all it will be a fascinating object of future studies. There were opportunities to meet with representatives of the two universities in Urumqi, Xinjiang University and the Xinjiang Normal University, and Minzu University in Beijing. In Minzu University, Kasai and Durkin-Meisterernst presented the work of the Turfanforschung in Berlin and Yakup gave a lecture on Turkic languages. We also visited the IDP studio and the Dunhuang Reading Room in the National Library of China in Beijing.